Waterfront Square provides the best of city living with the atmosphere of a private resort. 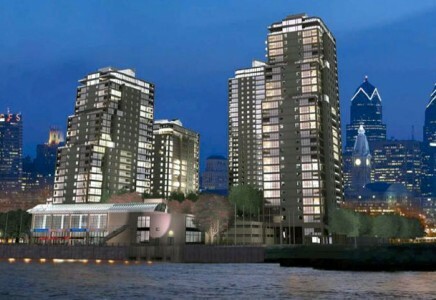 This gated waterfront community sits on the bank of the Delaware River and offers panoramic views of the Benjamin Franklin Bridge, the city skyline, and the surrounding area. With public transportation in close proximity, all of the city’s best restaurants, dining, and cultural activities are a quick train ride away. The coffee shops, boutiques, galleries, breweries, and gastropubs of Philadelphia’s red-hot Northern Liberties and Fishtown neighborhoods are only steps away. Comprised of five buildings ranging from 22 to 35 stories that surround a three-acre park, Waterfront Square’s 1.3 million square feet makes it the largest residential development on the waterfront. Residents will enjoy featured amenities such as 24-hour concierge, valet parking, private shuttle service, gated entry with an around-the-clock attendant, 12,000 fitness center with spa, and a private clubhouse with a sun deck. Let the James ‘Right’ Price Team’s real estate acumen find your new Philadelphia luxury condominium in this exclusive gated waterfront community today!